A crash inside the Sumner Tunnel this morning caused backups past Day Square, while computer glitches have caused delays at Logan. Read more. WCVB report on the bird strike this morning. The plane returned safely - its windshield covered in blood and feathers. CommonWealth reports Massport thinks the answer to growing auto congestion at Logan is to do something about the estimated 15 million rides Uber and Lyft riders now take to the airport - including increasing the ride-share surcharge from $3.25 for pick ups to $5 for both pick ups and drop offs. Massport also wants to eliminate 1,000 parking spaces on the first floor of the central garage to make way for a new centralized area for ride-share drivers to go when they're hailed or dropping off. 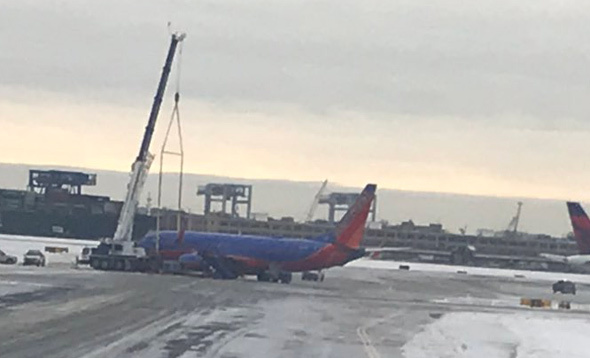 Paul Nutting captured a Southwest jet getting winched up at Logan after it got stuck on the tarmac at Logan this morning. State Police report arresting Nicholas Franco of Newton, whom they say got out of his car and attacked the driver of a cab behind him, at Jeffries Street and Transportation Way around 9:10 a.m. on Friday. Read more. Lot of pot. Photo by State Police. 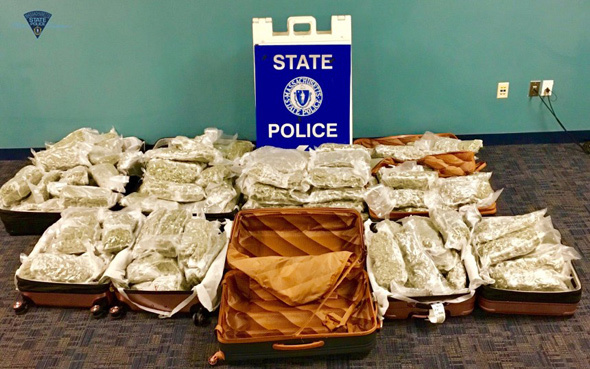 State Police report arresting three Californians they say each arrived at Logan Airport with 50 pounds of pot in their luggage on Saturday. Read more. 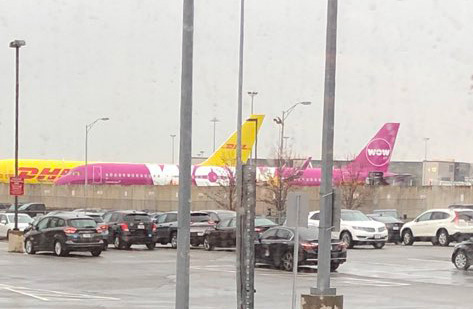 WBZ reports passengers on planes that made it into Logan last night then had to just sit on them for up to two hours. 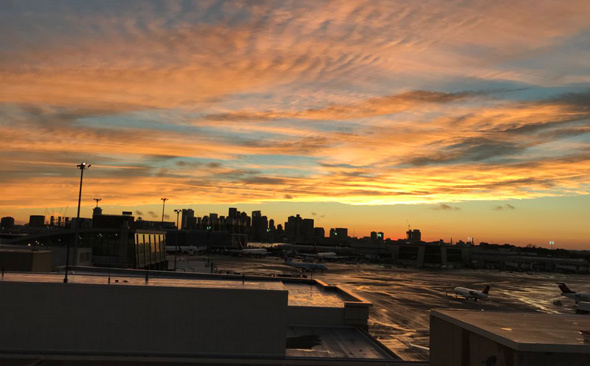 Bob captured the sunset over downtown from Logan Airport this evening. 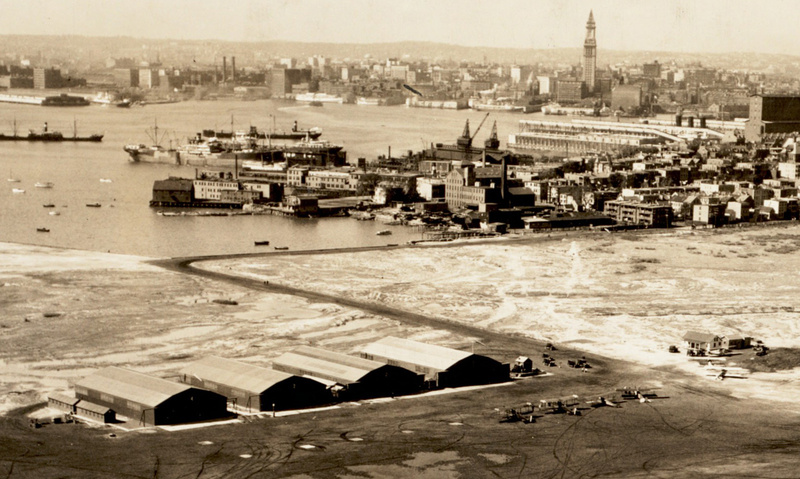 In 1925, Boston Commonwealth Airport (it had not yet been named after Gen. Edward Lawrence Logan) consisted of four hangars and one runway - which was enough for the biplanes that still used it - as shown in these photos taken by Fairchild Aerial Survey of New York. Read more. The Boston Public Health Commission reports anybody who might have visited the Tasty Burger on Boylston Street between 7 and 11 p.m. on July 19 or Terminal B at Logan Airport between 8:30 a.m. and 2:30 p.m on July 20 should check themselves for possible measles symptoms. Read more. 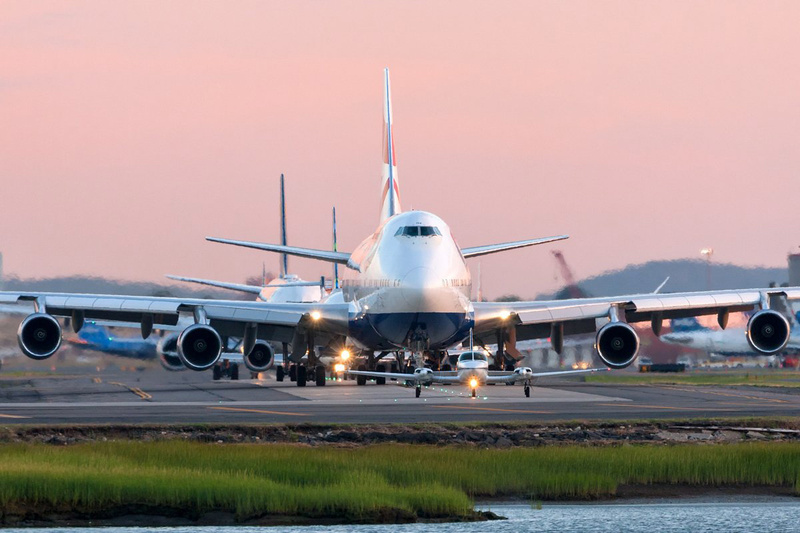 Tamas K-L watched a Logan taxiway last night, when a series of big beefy jets, including a British Airways 747, had to wait their turn to take off behind a Cape Air Cessna. A Boston health inspector this week shut a Boston Beer Works outlet in Logan Airport's Terminal C after a water heater there broke, leaving workers without a proper way to wash their hands. Read more. Last night, Erica Fletcher of Roslindale reported from Logan Airport: Read more. CNN posted this video of Angelica Gonzalez-Garcia, a Guatemalan national, being reunited with her 8-year-old daughter at Logan this afternoon, 55 days after they were separated by immigration officials in Arizona - who let Gonzalez-Garcia fly to Massachusetts, where she is now staying in Framingham, but sent her daughter in Harlingen, Texas. Read more. An honor guard at Logan Airport today welcomed home John MacDonald, a Somerville native and Allston resident, who, as a Marine, died on Nov. 20, 1943, during the first day of a battle to take the Pacific island of Tarawa. Read more. In Revere, Mike Cohea watched a plane heading into Logan - in front of tonight's full moon. Was Logan renamed on the same day the statue was dedicated? Was the name change from Boston Airport made also made on May 20, 1956, when the statue of General Edward Lawrence Logan was dedicated? Again, thanks to all of you whose answers to my questions have contributed to the authenticity of the background for this story. We're still on track for a June release and I can honestly report that this novel has been the most fun to write of any so far. I laughed out loud several times but also sank into a pretty dark place in a couple other scenes, based on some first-hand knowledge of others' experiences in the area.